Do NOT buy this machine. First one worked once and broke. Repairman out twice to fix. Had to order a part that would take 10 business days to come in. Complained and Best Buy just sent a new machine out - it doesn't work at all. and will be returned. Been with out a machine now for a month. Going to buy something else, somewhere else. Purchased March 3, 2010; frequent washer; just did a load of rugs (2 Scandninavian rag rugs 4 foot and 3 foot long; 2 bathroom rubber backed rugs; 1 6 foot rubber backed) in one load !!! and turned out great. 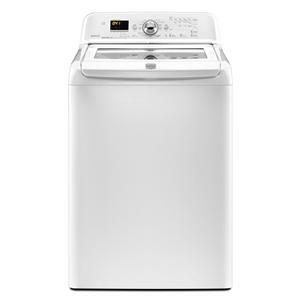 Prior to purchase the "wrinkling" reviews kind of made me wonder but I have not used the top spinning feature and there is a choice of no spin; light;medium; and max. And I use the light spin for permanent press and just came out great. Maybe people are putting it on max spin and wonder why its twisted and so wrinkly. Had a Maytag suds saver for 18 years prior to this one and am pleased with this washer as it does have the water spray feature. It is quiet in my basement laundry area and do not hear when it has turned off. Hopefully it lasts as when we picked it up the store warehouse person dropped it 3 feet to our truck tailgate and I now wonder if some of the reviews with problems of operations are more a problem of how the machine was handled before it was installed.